The rexx exec, I have created is called MINE. 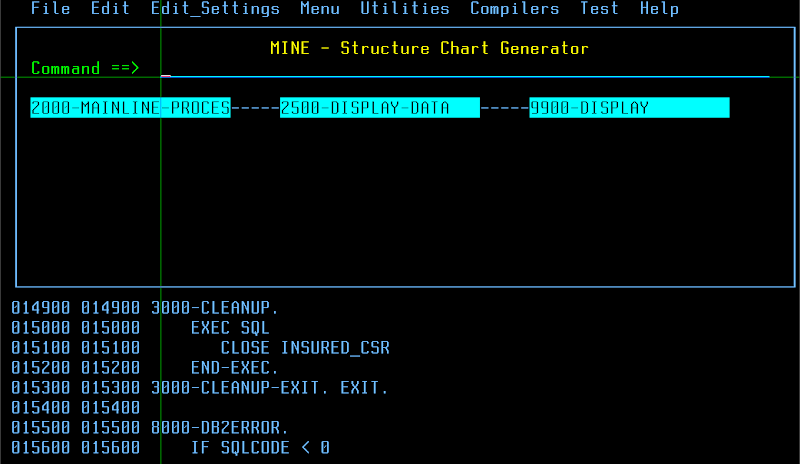 MINE refers to software mining and helps in the analysis of Cobol Programs. It runs as an Edit-Macro. The <Pf2> key is used to traverse down from Calling paragraph to the called paragraph. The <Pf4> key is used to back up. On pressing the <Pf1> key within a Cobol paragraph, it prepares a structure chart and displays all the caller and called routines. Take a look below. I am displaying the structure chart in a dynamic-area. For the sake of readability and ease of understanding, I am not putting the entire Rexx script here, instead I have pasted only a section of the code, that is responsible for generating the structure chart. The next level of functionality, I intend to add to the above structure chart is, the paragraph-name fields should be unprotected and the if the user places his cursor on any other paragraph e.g. on 2000-MAINLINE-PROCESSING and presses <enter>, its calling and called routines should be displayed. I am not sure, how to go about this. How do I make a part of the Dynamic Area, unprotected? How do I detect the cursor position? ADDRESS ISREDIT "FIND PREV P' #' 07"
ADDRESS ISREDIT "(LINEDATA) = LINE .ZCSR"
PARSE VAR LINEDATA TAG 08 GRAPH_PARA '.' . ADDRESS ISREDIT "X ALL 07 '*'"
ADDRESS ISREDIT "F ALL 'PROCEDURE' 08"
ADDRESS ISREDIT "X ALL .ZF .ZCSR"
ADDRESS ISREDIT "F 08 P'^' NX"
ADDRESS ISREDIT "F ALL "PARA_LIST.PARA_IDX" 08"
ADDRESS ISREDIT "(LINENUM) = LINENUM .ZCSR"
ADDRESS ISREDIT "(LASTLIN) = LINENUM .ZLAST"
ADDRESS ISREDIT "(LINEDATA) = LINE "LINENUM""
Any help or pointers to other articles would be highly appreciated. is bit of a no-no as for most people, and by convention, F1 is the help key and you should be providing a help panel. Yes, I completely agree. Those are the just Pf-Key assignments, I used. Hey, do you have any inputs on the question, I have above? I have done very little with dynamic areas, perhaps one play and one real, so I would have to go and read the manual which you can obviously do. First place I would look is at the ATTR section to see if you can specify input/output. Other places would be a Google search on ISPF DYNAMIC AREA as I know that there are articles out there. The offsets in the shadow variable need to match the offsets in the text variable. use the dataout attribute in the text variable. ¬Please enter your DSN . . . The shadow variable has all blanks. See also the .CURSOR and .CSRPOS functions. When you display the panel, the text in the input field will be one color, perhaps turquoise, because of the shadow variable. But when you type, the color of that character will be shown in yellow because of the DATAIN attribute. The ISPF editor does the same thing when highlighting is turned on.